Why Should I Take a Probiotic Supplement? Digestive balance is key to overall health and wellbeing. That said, there are many things that can negatively impact the balance of good bacteria in your intestinal tract, including stress, travel, diet and age, just to name a few. That’s why it’s important to replenish and fortify your digestive system on a regular basis through a healthy diet, exercise and a probiotic supplement such as Primadophilus® Fortify™*. How Often Should I Take a Probiotic Supplement? Probiotics are transient ‘guests’ within our digestive tract. Therefore it’s a great idea to make probiotics a part of your daily routine to help maintain digestive balance and support immune health*. Do Probiotics Have Side Effects? Some people may experience an increase in flatus due to the higher amounts of probiotic bacteria in the digestive system. However, this should subside within a few days as your body adapts to the increase in probiotic bacteria. If you experience issues for more than a week, reduce the amount of probiotic you take. How Important is Probiotic Stability and Survivability? By definition, probiotics are live microorganisms. As such, moisture, as well as the acidic environment of the stomach, can be detrimental to probiotics. That’s why the strains selected for all Primadophilus® Fortify™ probiotic products undergo a unique stabilization process to ensure best-in-class stability and survivability from stomach acid. In addition, the probiotics in Primadophilus® Fortify™ are encapsulated in a delayed-release capsule that helps protect the active cultures from moisture and resists stomach acid better than standard capsules to help deliver probiotics to the intestine. Are All Probiotic Strains Created Equal? Probiotics are comprised of three unique and important parts – the genus, species and strain. When evaluating a probiotic supplement, it’s important to consider the strain(s) used since health benefits are unique to the strain(s), not the genus or species. What Should I Consider When Choosing a Probiotic? CFU is an acronym used on the labels of most probiotic containing products. It refers to "colony forming unit" and is a measurement used by microbiologists to denote the amount of active cultures, or good bacteria, found in a probiotic product. What’s the Connection Between Digestive Health and Immune Health? We all know the main purpose of the digestive system is to breakdown and digest food so nutrients can be absorbed. However, considering approximately 70% of the body’s immune system is located in the digestive tract, the digestive system is key in supporting the body’s natural defenses by helping protect against unwanted visitors. What Are Some Ways I Can Support Digestive Health? How Should Probiotics be Stored? Some probiotics require refrigeration; however, Primadophilus® Fortify™ probiotics are formulated with strains that undergo a unique stabilization process to ensure best-in-class stability. When stored in a dry place, not in direct sunlight at or below 73° F / 23° C, Primadophilus® Fortify™ is designed to maintain potency through the expiration date noted on the bottom of the carton. Can I Take Probiotics While I’m Pregnant? If pregnant or nursing be sure to talk to your healthcare professional regarding your dietary decisions. 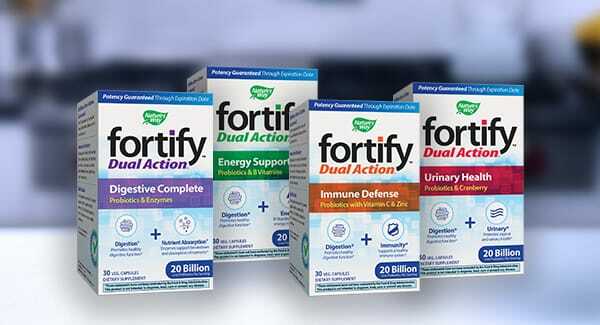 How does Fortify Age 50+ differ from Fortify Daily? 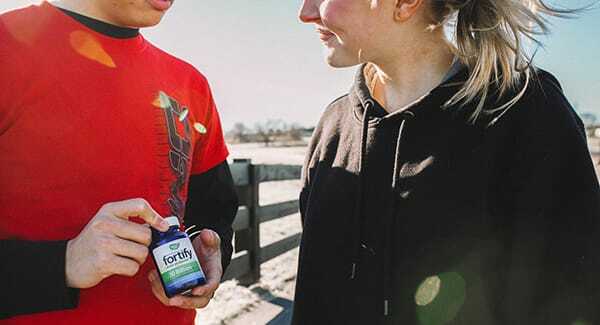 Fortify Age 50+ has a higher amount of bifidobacteria to help replenish bifidobacteria levels that can decline with age. 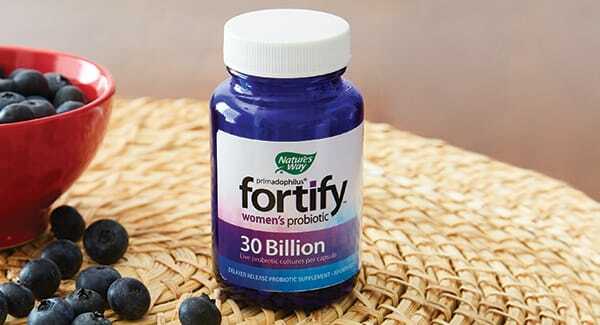 Fortify Age 50+ also has a few different probiotic strains when compared to Fortify Daily. Bifidobacteria is a type, or genus, of probiotic bacteria that is predominately found in the large intestine, or colon, where it supports overall digestive health. Overwhelmed with your probiotic choices? Let us help you break down exactly what’s important when selecting a probiotic. Learn how we pack probiotics with added ingredients to help you tackle even more.